Born in Dublin, Pat Harris studied at NCAD and Higher Institute of Fine Art, Antwerp. He is regarded as one of Ireland’s leading figurative painters. He currently lectures in Painting at the Royal Academy of Fine Art, Antwerp where, among other things, he has initiated an Erasmus exchange programme for students and lecturers with NCAD; under this scheme, he has taught regularly in NCAD. While his early work was based on the human form, in his recent work he has turned to still life and landscape as central motifs; here he often pares down the image to a mere tracing, a memory of its presence. He has exhibited widely in group shows in Ireland and throughout Europe with numerous solo exhibitions in Belgium: De Zwarte Panter Antwerp, Gallery Brabo Antwerp, Gallery S65 Aalst and in Ireland – at the Fenton Gallery in Cork, Fenderesky Gallery Belfast and Taylor Galleries Dublin. 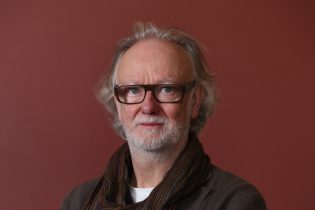 His work is represented in a number of public collections, including: The Arts Council of Ireland, The Irish Museum of modern Art, Dublin, The Hugh Lane Municipel Gallery of Modern Art, Dublin, The National Self-Portrait and Contemporary Art Collection Limerick, University College Dublin and The University of Antwerp, Belgium. He is represented by Taylor Galleries, Dublin and Purdy Hicks, London.